Higher Education Commission invites the applications from the eligible candidates for HEC Hungarian scholarship. The Hungary scholarship is offered by the Hungarian government and HEC portal is now opened for Stipendium Hungarian scholarship program 2019-20. Now you can apply to study in Hungary. The Stipendium Hungaricum scholarship is provided for the Pakistani students, who fulfill the basic eligibility criteria in the specified disciplines and other requirements of Hungarian universities to do bachelor degree, master degree and PhD degree. 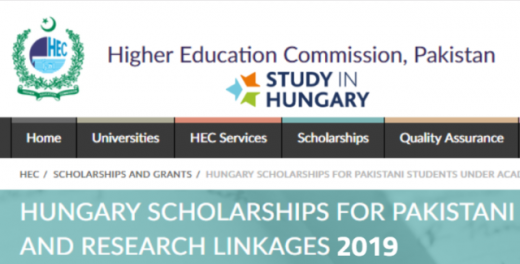 The Stipendium Hungarian scholarship program 2019-20 under bilateral higher education and scientific exchange program between Higher Education Commission, Government of Pakistan and Hungarian government. The Higher Education Commission, Islamabad and Tempus Public Foundation Hungary manage the program. The candidates will visit the following websites to get more information about all degree programs and the fields of study. If the applicants are asked to apply against specific degree program, which are mentioned here and the specific field of priority area / disciplines, which are defined by HEC as stated against each degree program. Applicant must be Pakistani / AJ&K citizen. The age of the candidate must be between 18-22 years for undergraduate programmes, for which they are applying for admission and age limit should not more than 35 years for postgraduate Master’s (18 years) and Ph.D. programs on 31st December 2018. Full-time employees of public sector Universities, Colleges and R&D organizations may have maximum age of 40 years on 31st December 2018 for PhD programs. The applicant must have passed his / her HSSC/Intermediate or equivalent for application in 04 years Bachelor’s (Undergraduate Program). The applicant must have passed his / her 16 years Bachelors/or equivalent Degree for application in Master’s (Postgraduate Program). The applicant must have passed his / her 18 years Degree/or equivalent for application in the Ph.D. Program. The applicant must complete all fields of Hungary Application Form and HEC application form and they should leave no column or field incomplete. Certificates/Transcript/Degrees to be attached must be attested by attesting authorities like IBCC and HEC. Equivalence of O & A level from IBCC is mandatory. It is sole responsibility of the candidate to ensure that all technical / engineering / professional programs, which they are applying, must be accredited by the respective Councils/Governing Bodies such as PEC, PMDC etc. In case of final selection, applicants will have to submit bond on legal paper to HEC that he/she will not change the program after final award of scholarship and after completion of his/her degree, he/she will return to Pakistan immediately to serve the country for period prescribed by the HEC. In case of failure to do so, HEC reserves the right to recover the penalty amount from candidate or his/her guarantor, as prescribed / decided by HEC. In the case of final selection, candidate submit the bond agreement. Please Check the Detailed Information & procedure of applying.